Thanksgiving is just around the corner as the Holiday season is almost officially upon us! 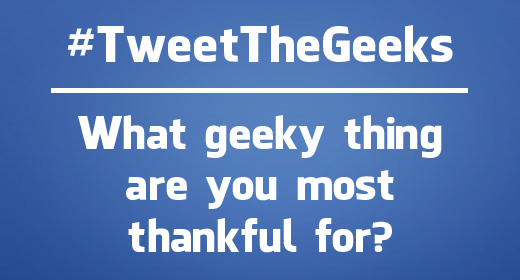 This week’s #TweetTheGeeks Question of the Week is this: What geeky thing are you most thankful for? There is no right or wrong answer, and we want to hear from you! We’ll feature all of your answers on this week’s episode of the podcast! I’m most thankful for the Streetpass feature on my 3DS, through which I’ve connected with friends & strangers alike. I also first discovered JustUsGeeks.com via a Streetpass from one Brandon Smith. @JustUsGeeks I am thankful to have @James_Strachan in my life.